This Associated Press article was published in major newspapers across the USA and appeared in 4 countries. SPRING VALLEY, Minn. (AP) - For his love of caves, John Ackerman has fallen into deep pits, nearly drowned in an underground stream and barely escaped being crushed by tons of rock. It's no wonder his wife insists on a $2 million life insurance policy. Over the past 16 years, Ackerman has spent more than $1 million buying and digging up southern Minnesota farmland in search of caves unseen by human eyes. With his modified track hoe, "Cave Finder," he's discovered or expanded 19 caves on his 325-acre plot in Fillmore County. His Cave Farm is considered one of the largest privately owned cave complexes in the United States. Yet, it's virtually unknown to the public because he's made no effort to commercialize it and doesn't intend to. Nontheless, his aggressive tactics - constantly unearthing farmland and using explosives - draws the ire of some. To others, he is a conservationist who generously opens his caves to explorers. Friends describe him as a hard-charger. 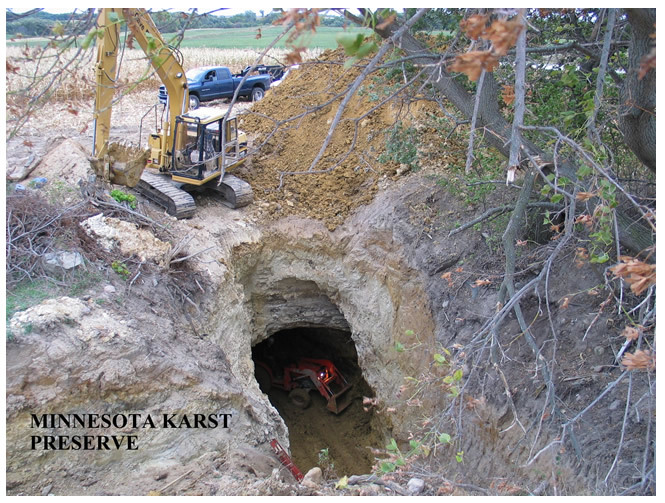 Clay Kraus and John Ackerman unearth a cave at the base of a sinkhole. An avid cave explorer since he was a boy, the 49-year-old Ackerman says he grew frustrated in the mid-1980s when many of Minnesota's best-known caves began limited access or refusing entry altogether. Many caves closed because owners feared litigation if someone got hurt, others were turned over to state or federal authorities who reduced opportunities for spelunkers. That's why Ackerman says he went to great expense and battled neighbors and other exploreres to find his own caves. "You're walking through a slice of time," he says as he surveys an excavated sinkhole that recently became his 19th cave. "To be the first human being to explore them is pretty much why we do it. And once we have discovered them, they're going to be here forever. They're going to be known, studied, photographed." When he's not running his furniture restoration business in Burnsville, Ackerman and "Cave Finder" can be found scooping out sinkholes in search of darkened dirt or white-spotted stones - telltale sign of moisture that can lead to cave entrances. Experts say the Cave Farm was likely created over hundreds of thousands and millions of years as water sifted through the soil, dissolving the 450-million-year-old limestone.